Shelf-Appeal: Refrigerated in a air-tight plastic bag. You can find the box by the hummus, tortillas and vegan lunch meat. The box photo doesn't do this product justice. Label Check: Nice. Per 120 calorie, 128 gram serving, two servings per package: Only 2 grams of fat-shocking for the taste. (Zero grams saturated fat). 17 grams of vegan protein. Both soy and pea protein are present. 9 grams carbs. 45% RDA of iron. There is quite a bit of sodium: 480 mg, which is about 20% RDA. So if you are watching your sodium, you want to be aware of the amount in this and all shelf-ready products. Overall, a delicious source or low-fat vegan protein and iron. Taste test: Moist. Tender as can be. Perfectly sweet with a mild smoky-spicy flavor kick. 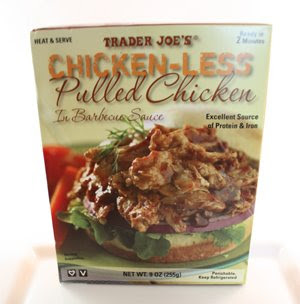 Next to a restaurant-quality seitan dish, this is the most tender vegan protein product I have ever tasted. Perfect for a quick sandwich-the flavors are so complex all you need is bread! Price: Around $3.49. Great value. Last Word: This product has made it on my must-have TJ's products list. Right up there with my other TJ brand faves: Vegan Pad Thai, Savory Crisps, Soy Nuggets, Soy Pitas and Sun Dried Tomato Hummus.